Twenty years ago, the book Crossing the Chasm was on every technology marketer’s must read list. Today few people are aware of it despite it remaining every bit as relevant as the day it was published. The lessons we applied from Crossing the Chasm to our business were a big part of Wealthfront’s rapid success — yet every step of the way competitors and pundits thought we were nuts. To explain why I must first provide some background of what Crossing the Chasm means. The book’s premise is that every technology has an adoption life cycle. Start-up products initially appeal to “innovators,” people who want to try every new thing, but who are seldom willing to spend very much (if anything) for products that interest them. Then come the “visionaries,” early adopters willing to take a chance on a new product if it solves a burning problem. All they need is a proof of concept to take the leap of faith. After the visionaries come the “pragmatists.” No matter how well a product serves their needs, they buy only after friends or colleagues have recommended it. Typically, the pragmatists or the “early majority” represent by far the largest market segment. The “late majority,” conservatives who buy only after a product has become the standard, follow the early majority. Finally come the “laggards,” who never buy. 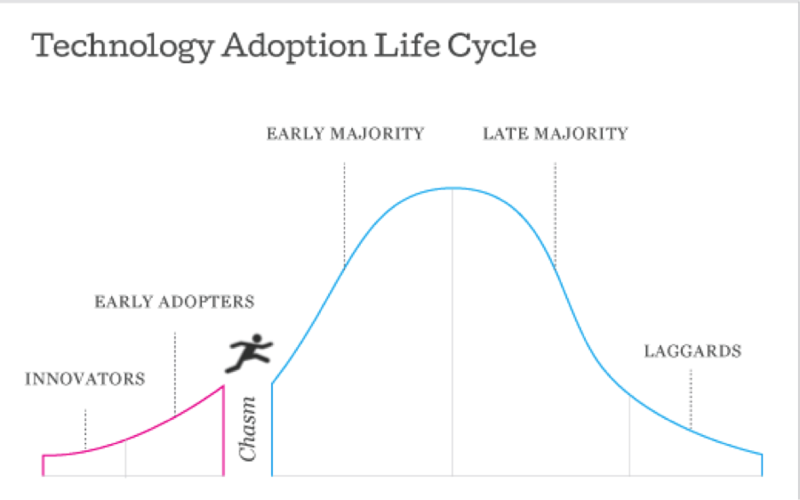 The chasm lies between the early adopter and early majority stages. A whole product is required for a technology to cross the chasm. It includes the features, interfaces, and third party products and services needed to garner the references required to sell the new technology to a broad and demanding audience. Geoffrey Moore, the book’s author, argues that companies must first dominate a niche of early adopters and expand from a position of strength to succeed. This advice contrasts with the view, commonly held by many of today’s entrepreneurs, that companies need to address a large market from the start. In their eagerness to win, entrepreneurs ignore the lessons of history. Name a successful tech company. The overwhelming odds are it followed Moore’s advice. Facebook started with students at Ivy League universities. eBay focused first on collectibles. LinkedIn’s initial target was execs in Silicon Valley. Google’s early ads appealed to start-ups that couldn’t afford the minimum buy associated with banner ads. Amazon started with books. Each company added functionality and addressed a broader audience, but over time, not from the beginning. Over my long venture capital career, the biggest mistake I saw start-ups make was attempting to skip the early adopter stage to move directly into the early majority stage. After all, that’s by far the biggest chunk of the market and founders wanted to get big, fast. The problem is that reaching the early majority requires references. Without them they aren’t going to buy the startup’s product — no matter how compelling it is. Unfortunately these founders thought they were following the precedent of the successful companies they revered. What they didn’t realize is almost every successful company revises its history to make it more appealing to early and late majority prospects. Successful companies don’t lie about the past; they just try to protect consumers from unnecessary details that will get in the way of people buying their products. Consumers want to believe the product they’re buying has a broad appeal because that makes them feel more comfortable making an economic commitment to it. The only path I know of to success is to start with the early adopters who are desperate for your product and build references among them to address adjacent markets. When Wealthfront launched its automated investment service in December 2011, we faced a classic chicken and egg problem. How do you attract assets to manage if you don’t have any? The traditional way most people evaluate investment managers is by their assets under management even though it is a terrible proxy for quality. In our case assets under management was the equivalent of references needed to add clients and grow, or so we thought. One of our investors suggested we initially focus on young people who work in technology because they would be more interested in the quality of our user experience than our assets under management. They also didn’t have an alternative to what we offered because our $5,000 account minimum stood in stark contrast to financial advisors’ typical $1 million minimum, which few could afford. That turned out to be amazing advice. We initially focused on Facebook employees because we thought they were the most likely to spread the word if well served and many were likely to come into money with the impending IPO, though not enough money to pique the interest of a financial advisor. We gave educational seminars to Facebook employees on how to invest well that never mentioned our service because we knew that would turn them off. Fortunately our early efforts, which we knew were not scalable, paid off handsomely. Our assets under management took off out of the gate. Once we had some traction with Facebook, we moved on to the next most social local company, LinkedIn. We focused on finding the biggest influencer who turned out to be Adam Nash, who is now our CEO. Early success at Facebook and LinkedIn caused word of our service to spread such that we were able to attract clients from many of the leading technology companies including Amazon, Apple, Dropbox, Google, Microsoft, Palantir, and Salesforce. Our narrow focus on Millennials caused our clients to invite their friends outside tech and in many cases their parents. After two and a half years we now manage more than $1 billion and less than 40% of our clients work in the technology business (although 60% are under 35). For context it took Charles Schwab six years to reach the same milestone and their growth rate accelerated once they achieved $1 billion under management. Breaking through $1 billion was likely the critical reference required for Schwab to cross the chasm into a much larger market. To be a great entrepreneur, you must be non-consensus and right. Oddly, one of the bestselling business books of the last generation is now considered non-consensus advice. But as far as I can tell, Crossing the Chasm is just as relevant today as when it was published in 1991. There are very few exceptions to its two-step rule in the recent history of successful companies. First, you develop a focused product that appeals to a small, passionate audience. Then, over time, you build the whole product and references that attract a broad one.